NVIDIA’s stock has rallied 3x in the last one year and now trades at a market capitalisation of $63bn. 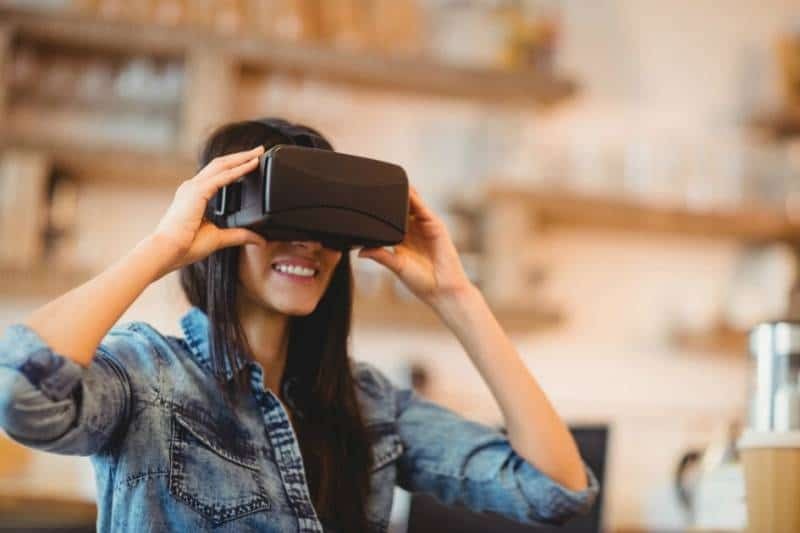 NVIDIA is leading its way in the GPUs market and benefiting from significant progress we are seeing in the fields of Virtual Reality, Artificial Intelligence, Internet of Things and Big Data. For an amusing demonstration of how GPUs and CPUs work, you can watch this video by the guys from MythBusters. At the CMP of $114, the company is trading at a P/E multiple of 42. The consensus growth rate for 2016-2017 is 12% but given the recent outperformance by the company, the growth rate could be much higher. If you believe that the company can grow for more than 42% in the coming years, the PEG ratio would go down to a more comfortable 1.0. Given the euphoria in the stock and the markets in general, we are not jumping in right now but adding the stock to our watch list and hope to enter at a better price. You could track real-time, relevant, and personalised news feed for NVIDIA and competitors on CityFALCON’s financial news watchlists. We all know what the CPU does: it processes coded instructions to make our computers do what we want them to do. Many of us may also know GPUs, because we can use them to play games or watch HD video. What is the essential difference between them? One processes its instructions sequentially, the other in parallel. For most of computing history, we have done it in the former way, but there are a lot of problems that are more efficiently done in parallel (same action but doing it many times on independent data points). Can you guess which is which? 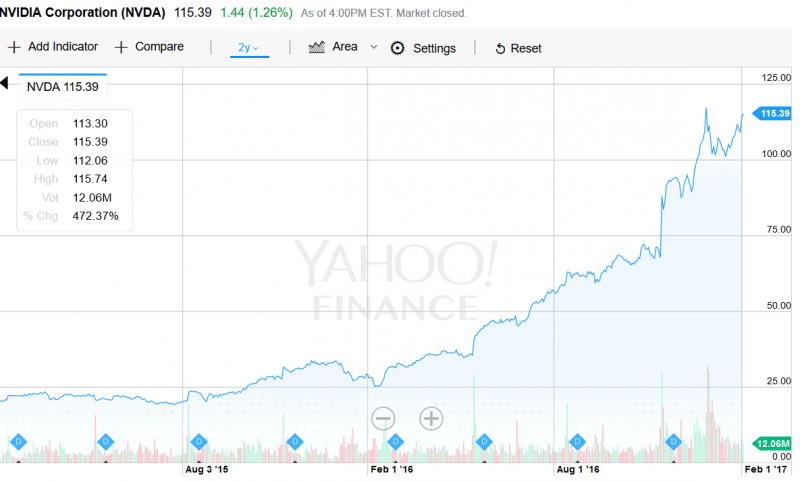 NVIDIA’s stock price has skyrocketed over the last year. What happened? The market cap of the company hit a high of over $63bn in the same 12-month period that it had a low of $13.7bn, which was only 10 months prior. Where did the extra nearly $50bn in valuation come from? The two year chart below shows the amazing run-up of the price during the past year. It seems like volume may be ramping up, too, though it is hard to tell from the chart alone. What’s the driver? Can we expect more growth or should we be looking for an exit (assuming we got in)? First, let’s look at what is happening in the ever-progressing world of technology. We did a post on ‘Who will be the winner in cloud computing and AI?’ last month. As it currently stands, the cloud computing arena is largely dominated by Intel, where they hold a 98% stranglehold over the processors in data centers (according to Intel). However, several problems today require parallelism to be efficient. The standard operating procedure has been to buy lots of high-clock CPUs and arrange the processing such that multiple threads could be run on multiple cores on multiple CPUs. This is all well and good, but GPUs are designed exactly for such a problem. They often have many thousands of cores that can perform operations (albeit at a slower speed). That implies higher throughput. While a CPU may be able to process each instruction faster, a GPU can process hundreds of data points at once. We just need to break problems down into parallelism. Some problems resist this restructuring, but many current problems do very well in that structure, including deep learning for AI, virtual reality (because a huge part of it is simply just graphics), and analytics (that includes applications in finance). 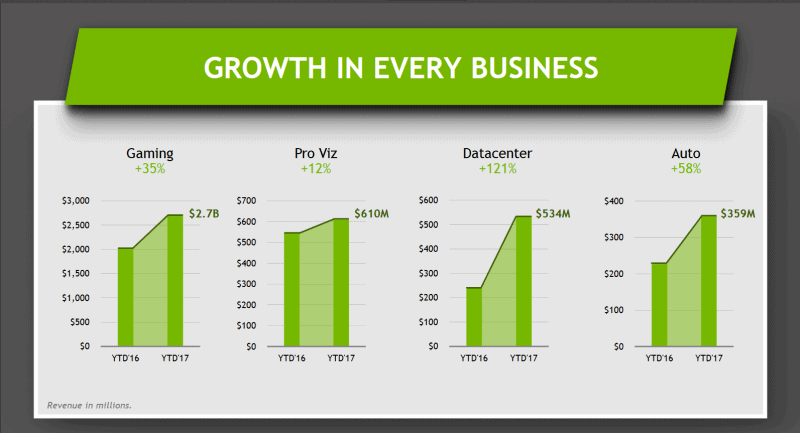 NVIDIA has been making GPUs for a long time, and their biggest base is still the gaming community. Computer game enthusiasts are always looking for next-gen graphics, and NVIDIA is able to deliver the power to do it. Professionals also need high powered graphics processing for their applications. But perhaps the most interesting area is in HPC, or high-performance computing. Here, NVIDIA offers their highest-end chip to universities, businesses, and government to do research in all kinds of ways. Big Data is the future, and we need a way to process all the data. Quadrillions of data points are not very useful just sitting in a server farm somewhere; they need to be analyzed for patterns, and GPUs are perfect for doing such work. For an amusing demonstration of how GPUs and CPUs work, you can watch this video by the guys from MythBusters. It will give you a better idea of how computing is changing, and what it is changing into. A long time ago (decades), personal computers were meant for spreadsheet and word processing software. Then they became gaming machines. Then they became used for everything. Today, it is impossible to get away without having a computer for anyone in a service job. Not having a computer (in the form of a PC/Mac or a smartphone) can be social suicide. But computers will do so much more in the future. Virtual reality (VR) is poised to become a huge market, and not just for games. Anything that we simulate now will probably be simulated in VR in the future, because it provides a more immersive experience. Games, sure, but virtual tours, virtual business meetings, virtual interaction. This is sure to come in the future. VR requires the processing of a lot of 3D graphics, so we can see how NVIDIA will benefit from this trend. Another hot topic in computer science is AI. A true AI is unlikely for a while, but a major current trend in the research is “deep learning” and “machine learning”, which looks at large amounts of data and processes every point the same way to determine relationships. This type of processing is exactly the parallel structure that GPUs are good for. Because the data is processed the same way, it is completely natural to use GPUs for the task as opposed to CPUs. Even more, the Internet of Things often has NVIDIA chips integrated into the embedded systems. This sector is going to be huge, because people want to be able to control their appliances with their phones remotely. But cars are also an important arena, because self-driving cars are on the way. They need to process hundreds of inputs simultaneously to ensure they don’t crash. GPUs can be used for that purpose. Furthermore, the “ubiquitous cities” concept, cities that have their infrastructure integrated and communicating with itself, is going to require processing of huge amounts of input in real-time. GPUs seem like an efficient way to process all the data. A final important computing area that will certainly see NVIDIA chips integrated is that of Big Data. We as individuals may not be doing this so much (some of us, like myself, do play around with machine learning, though not to the extent that Google or Amazon does), but the titans of tech certainly are. They are collecting endless mountains of data, and they will be processing all that data, likely with programs that will necessarily use parallel structure to be economically and temporally feasible. And even if Google or Facebook goes away, government agencies like the NSA and GCGQ have plenty of use for processing large amounts of data in repetitive fashion. Someone needs to manufacture the chips for this. This all seems like great news for NVIDIA. And it is. A long-time chipmaker that now has more than just gaming as its base – though, to be fair, the computer gaming community is large and rather robust, so NVIDIA could probably survive just off them in the future. However, we must be ever vigilant lest we fall behind. So, where is NVIDIA vulnerable? First, the other chip manufacturers are not sitting idly by. Intel is pushing ahead with new processor designs, and the release of Knights Landing could be trouble for NVIDIA. It is not the thousands of cores offered by GPUs, but it comes packed with up to 72 cores, which is a very high number for a CPU. Intel also owns the “fabs”, or factories that actually produce the chips. NVIDIA does not, so they outsource the manufacturing itself to companies like Taiwan Semiconductor Manufacturing Company (TSMC) – yes, that is the name. Apparently, engineers are not very creative with company names. But a conflict between NVIDIA and its fab provider could spell trouble for the company. Another problem for NVIDIA is that AMD is planning on releasing some high-end chips, which can only serve to cut into NVIDIA’s market share. The Polaris line of chips is a direct competitor, because it is also a GPU (as opposed to the Knights Landing CPU from Intel). It is also expected that the chips will sell for less than NVIDIA’s (this is probably a major driver of the equally spectacular rise of AMD’s stock price over the last year). Furthermore, companies like Google, who drive so much of the Big Data hardware demand, are starting to look at manufacturing their own, customized chips to better handle their specific needs and data resources. Car manufacturers will probably remain simply car manufacturers, leaving the electronics hardware to the semiconductor producers, so at least that is bright sign. Of course, just having good technology and a bright future isn’t enough; the company needs to have solid financials, too. The numbers are in millions. Clearly gaming is still a huge part of the business, but the other parts are not insignificant. Datacenters, and especially autos, will likely only grow into the future. 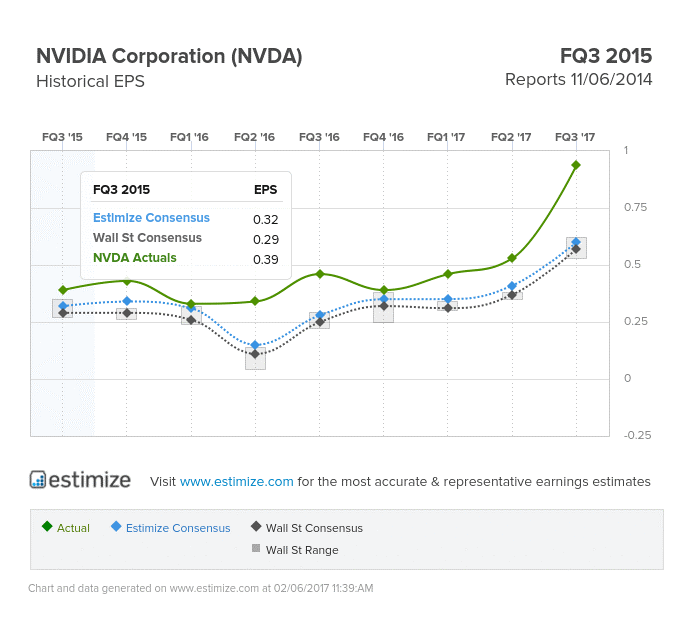 NVIDIA was a great pick for 2016, but I would tread with caution. There is a lot of potential for GPUs, and NVIDIA is at the forefront of the technology at the moment. 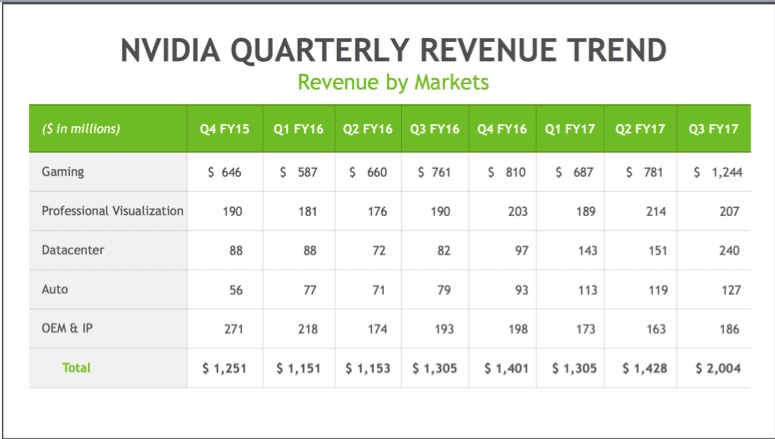 But competition is fierce, and there is more than one big player in the semiconductor business that wants to best NVIDIA. 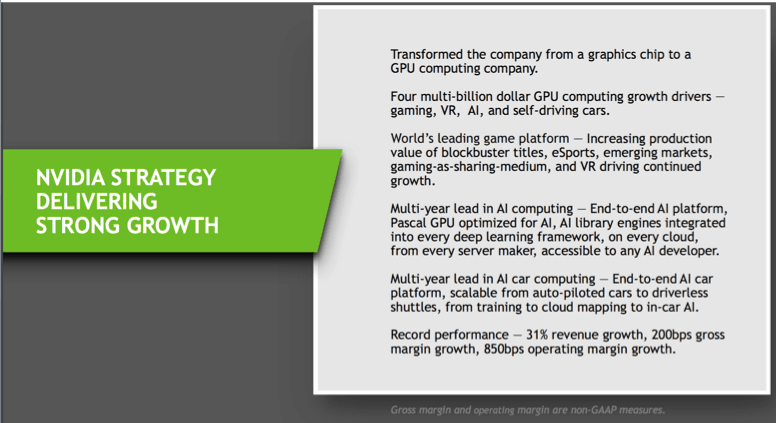 There’s no doubt that GPUs will be even more integrated into our lives in the future, but the meteoric rise of NVIDIA’s stock should give you some pause. With gains like that, even accompanied by a reasonable PE ratio in relation to the industry, you may want to do some more analysis, because the brightest stars also exhaust their fuel the fastest. You could track real-time, relevant, and personalised news feed for NVIDIA and competitors on CityFALCON here. David Mills on EIS – The Best Tax Relief Scheme for Risk-Taking Investors in the UK? Jarrod Varoz on What’s common between the supermarket & leverage trading (spread betting, CFD, and FX) industries?